FOUNTAIN INN, SC--(Marketwired - November 02, 2016) - AVX Corporation (NYSE: AVX), a leading manufacturer and supplier of passive components and interconnect solutions, has released a new series of supercapacitor modules. Comprised of series-connected cylindrical, electrochemical, double-layer supercapacitors, the new SCM Series supercapacitor modules are currently available in two voltage ratings (5V and 5.4V), and exhibit optimal pulse power handling characteristics, including: high capacitance values (0.47F - 7.5F ±20% tolerance), low ESR (4mΩ - 300mΩ at 1,000KHz), low leakage (2µA - 1,000µA), high energy density (1 to 5.6Wh/kg), and long lifetime performance (50,000+ cycles). Designed to provide reliable hold-up, energy harvesting, and pulse power solutions, SCM Series modules can be used alone or in conjunction with primary or secondary batteries to provide extended backup time, longer battery life, and instantaneous pulse power in applications including: uninterrupted power supplies (UPS), wireless alarms, remote meters, global systems mobile (GSM) and galvanic skin response (GSR) transmissions, camera flash systems, scanners, toys, and games. "Our new SCM Series supercapacitor modules deliver optimal pulse power handling characteristics that significantly outperform the competition at a very competitive price," said Shawn Hansen, the worldwide business manager for specialty capacitors at AVX. SCM Series supercapacitor modules are rated for use in operating temperatures spanning -40°C to +65°C at 5.0 - 5.4V balanced, or, with voltage de-rated to 3.9 - 4.6V per cell, -40°C to +85°C balanced. Unbalanced options are also available. Packaged in plastic or shrink-wrapped cases spanning 14mm to 24mm in length with vertical or horizontal radial leads, the series is compatible with hand, reflow, and wave soldering so long as appropriate precautions are enacted, and is both lead-free compatible and RoHS compliance compatible. All SCM Series parts are tested and qualified for life cycle, high temperature load-life, temperature and humidity characteristics, and vibration resistance, and are shipped in bulk packaging. Current lead-time for the series is four to eight weeks, and custom modules are available upon request. 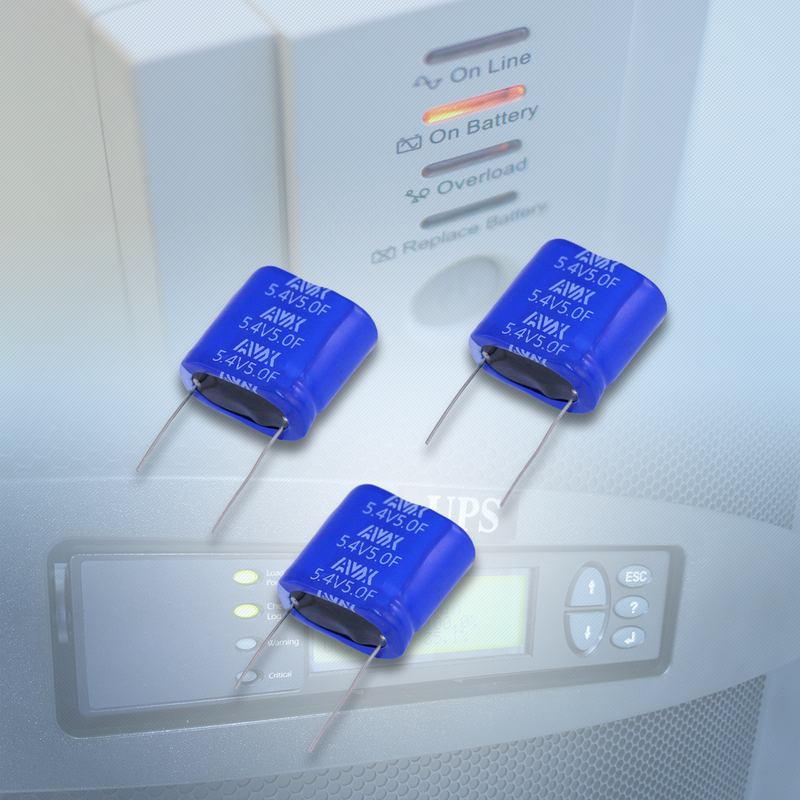 For more information about AVX's new SCM Series supercapacitor modules, please visit http://www.avx.com/products/supercapacitors/scm-series/ to access the product datasheet. For all other inquiries, please visit www.avx.com, call 864-967-2150, or write to One AVX Boulevard, Fountain Inn, S.C. 29644. AVX Corporation is a leading international manufacturer and supplier of electronic passive components and interconnect solutions with 20 manufacturing and warehouse facilities in 11 countries around the world. AVX offers a broad range of devices including capacitors, resistors, filters, timing and circuit protection devices, and connectors. The company is publicly traded on the New York Stock Exchange (NYSE: AVX). A member of the Kyocera Group since 1990, AVX is also the only company authorized to supply Kyocera's electronic devices to the Americas and Europe. Established in 1959 and based in Kyoto, Japan, Kyocera Corporation is a leading international supplier of connectors, capacitors, ceramic resonators, surface acoustic wave (SAW) filters and duplexers, and crystal oscillators and timing devices.